R. D. Patidar , S. P. Singh and D.K. Khatod , "Single-Phase Single-Stage Grid-Interactive Photovoltaic System with Active Filter Functions", in Power and Energy Society General Meeting IEEE, July 2010, pp.1-7. M.C. Cavalcanti, G.M.S. Azevedo, B.A. Amaral, and F.A.S. Neves", Unified Power Quality Conditioner in a Grid Connected Photovoltaic System ", Electrical Power Quality and Utilization Journal, Vol.12, No.2, 2006, pp. 59-69. A.R. Reisi, M.H. Moradi and H. Showkati, "Combined Photovoltaic and Unified Power Quality Controller to Improve Power Quality", Solar Energy, Vol. 88, 2013, pp.154–162. S.W. Lee, J.H. Kim, S.R. Lee, B.K. Lee, and C.Y. Won", A Tranformerless Grid-Connected Photovoltaic System with Active and Reactive Power Control", In Power Electronics and Motion Control Conference, IPEMC '09, May 2009, pp.2178-2181. Marcelo GradellaVillalva, Jonas Rafael Gazoli, and Ernesto RuppertFilho, "Comprehensive Approach to Modeling and Simulation of Photovoltaic Arrays", IEEE Transactions on Power Electronics, Vol 24, pp.1198-1208 . Atiqah Hamizah Mohd Nordin, Ahmad Maliki Omar, "Modeling and Simulation of Photovoltaic (PV) Array and Maximum Power Point Tracker (MPPT) for Grid-Connected PV System", 3rd International Symposium & Exhibition in Sustainable Energy & Environment, 2011, pp.114-119. J.M. Enrique, J.M. Andu jar, M.A. Bohorquez " A reliable, fast and low cost maximum power point tracker for photovoltaic applications " in Solar Energy 84, 2010, pp.79–89. E.S. Sreeraj, K. Chatterjee and S. Bandyopadhyay" One-Cycle- Controlled Single-Stage Connected PV System, "IEEE Transactions On Industrial Electronics, Vol.60, No.3, 2013, pp.1216-1224. A. Chaoui, J.P Gaubert, F. Krim, "Power quality improvement using DPC controlled three-phase shunt active filter", in Electric Power Systems Research 80, 2010, pp.657–666. R. Lohde and F. W. Fuchs, "Improved DPC Method of VSC to Fulfill Low Voltage Ride Through Requirements in Wind Power Applications", 14th International Power Electronics and Motion Control Conference, EPE-PEMC, 2010, pp.T12-35-T12-42. ISNAD Boukezata, B. , Chaoui, A. , Gaubert, J P. , Hachemi, M. . "Active Power Filter in a Transformerless Grid Connected Photovoltaic System". 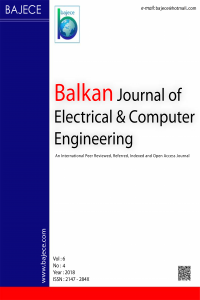 Balkan Journal of Electrical and Computer Engineering 2 / 3 (September 2014): 122-127.